Jigger, Stirrer (long Spoon), Rocks Glass, Cup, Pitcher. 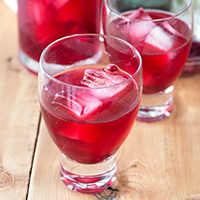 Combine Pomegranate Juice, Gin, and Campari in a Pitched filled with Ice. Stir well. Serve 4 oz of the mixture in Rocks Glasses filled with Ice. Garnish with Pomegranate Seeds.